Lovisa Selander is a goaltender from Sollentuna, Sweden, playing for Rensselear Polytechnic Institute. Before coming to North America to play for RPI, Selander played for a Swedish club named Stocksund-Danderyd-Enebyberg. Her best season was in 2013-14 when she recorded a 1.17 goals-against average and 0.959 save percentage in 13 games in the Division 1 league and a 1.09 goals-against average and a 0.959 save percentage in the AllEttan league. Her first year at RPI, Selander jumped into the lineup as the team’s starter. She recorded a 2.11 goals-against average and 0.939 save percentage with a 9-16-7 record. As just a freshman, Selander broke program records as her 1058 saves during the season brook the single-season program record. Selander was recognized with a multitude of honors at the end of the season. She was named a finalist for the ECAC Rookie of the Year award and ECAC Goaltender of the Year Award. Additionally, she was named to the ECAC Hockey All-Rookie Team and All-ECAC Hockey Third Team. On the team level, she was named RPI’s Rookie of the Year and was also recognized among all athletes at RPI as the Rensselaer Athletics Female Freshman of the Year. Selander excelled academically as well as she was named to the ECAC Hockey All-Academic Team. Selander cooled off a little as a sophomore. She recorded one additional win than her freshman year total and had a 2.78 goals-against average and 0.917 goals-against average. Once again, she was recognized by her team, this time as Team MVP. Selander also continued to work hard in the classroom and was named to the ECAC Hockey All-Academic Team for the second year. Last year, as a junior, Selander improved a bit from her sophomore year as she recorded a 2.22 goals-against average and a 0.932 save percentage with nine wins. During the season, she broke RPI’s career save record with 2935 saves over the course of her career. She was named to the All-ECAC Hockey Second Team at the end of the season and was honored with RPI’s Player of the Game Award. Additionally, she was named to the ECAC Hockey All-Academic Team for the third straight year. Selander has been excelling this year with a 2.04 goals-against average and a 0.943 save percentage. She has nine wins and could very well surpass her career record of ten wins in a season. In December, Selander was drafted by the Boston Pride 20th overall in the NWHL draft. She will graduate at the end of the year with a degree in chemical engineering. Rheault tallied four points in two games this weekend as the University of New Hampshire picked up two wins over Hockey East Opponent the University of Maine. During Friday’s 5-2 win, Rheault picked up two assists, one shot on goal, and a plus-three rating. Both assists came in the third period to help UNH put the game out of Maine’s reach. Rheault recorded another two points during Sunday’s 3-2 win. She scored the opening goal of the game on the power play and assisted on a goal less than two minutes later to help UNH get out to a 2-0 lead. Eldridge’s five points helped power Colgate to two conference wins over RPI and Union. In a 4-1 win against RPI on Friday, Eldridge recorded one goal, two assists, four shots on net, and a plus-two rating. Her first assist came on the power play on what ended up being the game-winning goal. She later added another assist and a goal in the third period to widen Colgate’s lead. On Saturday, in a 5-2 win over Union, Eldridge had a goal, an assist, four shots on net, and a plus-three rating. Both her points came on the last two goals of the game, helping Colgate extend another lead. Gabel had yet another impressive weekend with five goals and one assist in two games. In a 3-2 win over Quinnipiac on Friday, Gabel scored each of Clarkson’s goals to secure the hat trick. All three goals came at even strength from a team-leading five shots on net. Gabel added another two goals and one assist as she factored into each of Clarkson’s goals yet again in a 3-1 win over Princeton. Her second goal came on the power play and she finished the game with a team-leading seven shots on net. In last week’s must-see matchup between Clarkson and Princeton, Clarkson took the game 3-1 in a game showcasing Loren Gabel, a Buffalo Beauts’ draft pick, and Karlie Lund, a Minnesota Whitecaps draft pick. Gabel opened the scoring just 36 seconds into the game. However, Princeton was able to tie the game up just five minutes later. In what was a busy first period, Clarkson scored again to take another lead. This goal was assisted on by Gabel and stood to be the game-winning goal. Gabel added another goal in the second period and Clarkson shut down Princeton to take the game 3-1. Lund had a quiet night for Princeton with two shots on net and a minus-one rating. For this week’s must-see matchup, we will move over to the Hockey East conference where Merrimack and the University of New Hampshire square off in an afternoon game on Saturday, February 9. Puck drop is at 4 pm. This week’s third star of the week, Jenna Rheault will be someone to watch on New Hampshire. Rheault is a Boston Pride draft pick. 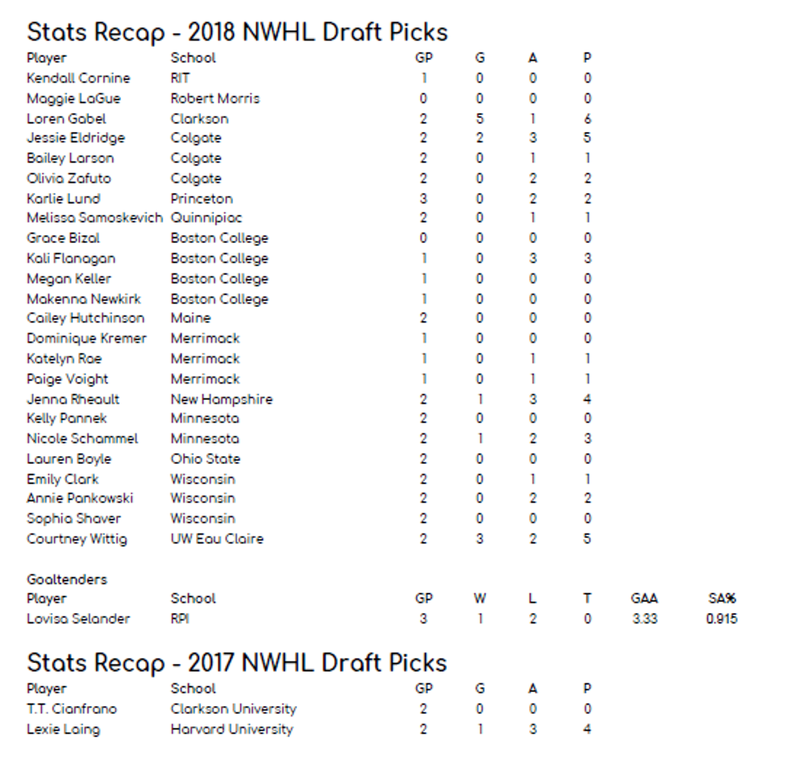 On Merrimack’s side, Dominique Kremer and Katelyn Rae are Connecticut Whale draft picks while Paige Voight is a Metropolitan Riveters draft pick. Loren Gabel, a forward for Clarkson, was named the ECAC Hockey Player of the Month for her efforts in January. She led the nation in scoring throughout the month with 11 goals and 17 points in just eight games. Gabel was drafted by the Buffalo Beauts eighth overall in the NWHL draft last December. Megan Keller, a defender for Boston College, was named the Hockey East Player of the Month as she had five goals and 12 points during January. Her 12 points led all defenders in the nation. In December, Keller was drafted third overall by the Buffalo Beauts.